What’s Next for Vietnam-Laos Military Ties in 2018? A recent defense interaction offered a glimpse into what lies ahead for the bilateral defense relationship. On March 20, Vietnamese and Lao defense officials held yet another round of consultations to discuss ongoing developments in military-to-military ties. The meeting was just the latest in a series of interactions that have offered a glimpse into what lies ahead for this realm of the bilateral relationship in 2018 and beyond. As I have noted before, Vietnam and Laos, both one-party, communist states in Southeast Asia, share an important defense relationship as part of their broader diplomatic ties, with various areas of focus ranging from Hanoi’s ongoing support of Laos’ military to the management of their joint border (See: “What’s Next for Vietnam-Laos Border Cooperation?”). The past few years have seen an uptick in the level of diplomatic activity between the two sides, including on the defense side. 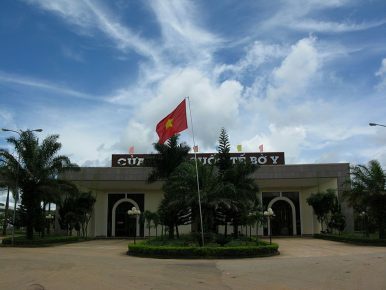 Much of this has been tied, as it often tends to be, to the commemoration of key markers in ties as well as domestic developments, with 2017 marking the 55th anniversary of the establishment of Vietnam-Laos diplomatic relations as well as the 40th anniversary of signing Vietnam-Laos Treaty of Amity and Cooperation, and 2019 seeing the 70th anniversary of the founding of the Lao People’s Army (LPA) and the 75th anniversary of the Vietnamese People’s Army (VPA) (See: “Vietnam-Laos Border in the Spotlight Amid Anniversary Celebrations”). The exchanges have continued on into 2018. Though there have been a series of ongoing activities, the highest level of engagement came in mid-January when Vietnamese Defense Minister Ngo Xuan Lich was in Laos for defense consultations at the invitation of his Lao counterpart, Senior Lieutenant General Chansamone Chanyalath. During those consultations, both sides reviewed progress on bilateral cooperation over the past year, mapped out priority areas for 2018, and signed off on a defense cooperation agreement. On March 20, both sides held another one of these bilateral defense interactions when Senior Lieutenant Phan Van Giang, the deputy defense minister and chief of the General Staff of the VPA, met with his Lao counterpart Suvon Luongbunmi in Hanoi amid a range of other military consultations between the two sides. Unsurprisingly, few details were publicly disclosed about the exact range of subjects discussed at the meeting itself. Vietnamese official accounts stressed that they focused on the importance of strengthening bilateral military cooperation as part of forging better party-to-party, state-to-state, and people-to-people ties, as well as unspecified regional and international issues of mutual concern. While these defense interactions were going on in Vietnam, others were going on in Laos as well. In remarks at a March 20 reception hosted in Laos for the General Department of Politics (GDP) of the VPA, both sides noted their intent to strengthen military-to-military cooperation in a range of areas. These included some of the traditional areas where collaboration is already ongoing to some degree, including all-level delegation exchanges, education and training cooperation, cultural and art exchanges, sharing experiences on party and political work at the local level, and coordination on the searching and gathering of remains of Vietnamese troops that had lost their lives in Laos. Interestingly but not unsurprisingly, in those interactions, Senior Lieutenant Nguyen Trong Nghia, the deputy director of the GDP of the VPA, also said that Vietnam’s military press would boost the publicity given to the commemoration of the LPA’s founding anniversary, including in the Lao language. It was yet another nod to the significance of domestic politics, party-to-party ties, and the media domain in the bilateral relationship, elements which are often missed in superficial accounts focused predominantly or solely on foreign policy. A recent defense interaction has once again highlighted the collaboration underway.